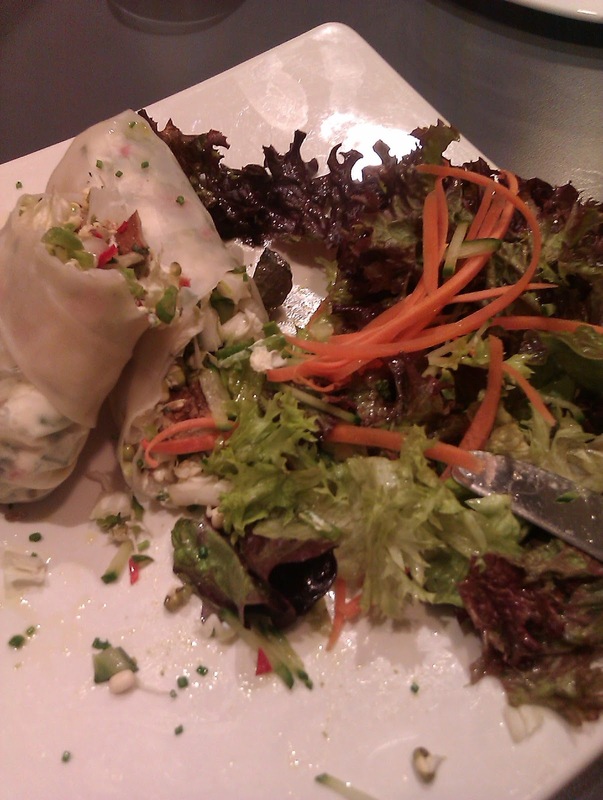 Yummy Vegan Ramblings: (Tr)eating out! This weeks excitement comes in the form of two wonderful restaurant visits. The first, Terre A Terre, is somewhere I've wanted to visit for ages but never have (it's pretty expensive with posh gourmet food) and the second was SAF (Simply Authentic Food). At Terre A Terre I was treated to this feast by my friend Lindsay, It's a mini version of each dish on the menu and really was fantastic. They were happy to alter the dish for me and gave us a great explanation of each bite (which I promptly forgot!) There was also a heavenly carafe of wine which I've been dreaming about ever since. 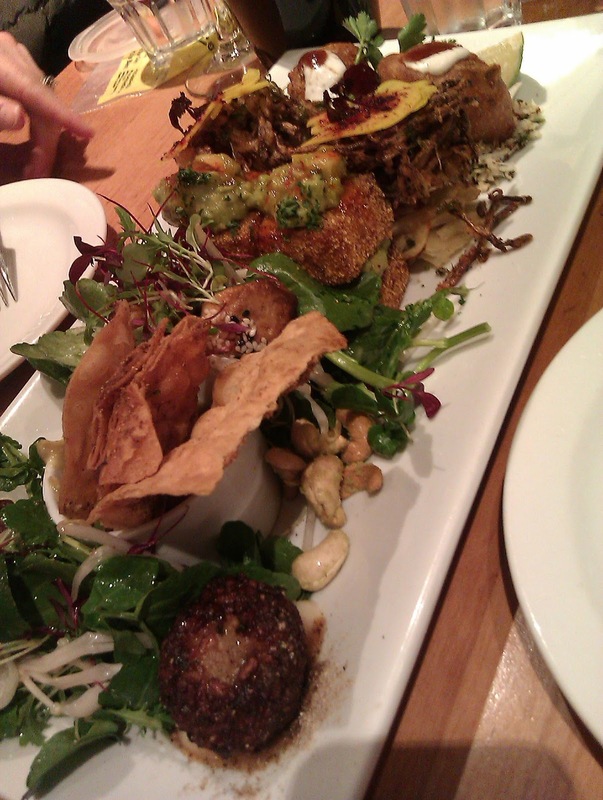 Without wanting to sound cheesy it really was an explosion - wait I googled a better word - eruption of flavours! I always strive to order things I haven't had before and this was no exception, the tastes and textures were exciting although overall I would have appreciated something a little starchy on the plate. Kind of ignorant to go to a restaurant with health and wellbeing at its core and then expect something naughty though! My friends had mushroom risotto made with bulgar wheat and Ratatuille Farinata so perhaps this is just another case of food envy on my part! I'd really recommend a visit, or at least check out the menu! Another big treat this weekend was my second ever Thai green curry made with love by my friend Hetti (and 2 lowly peeler/choppers!) 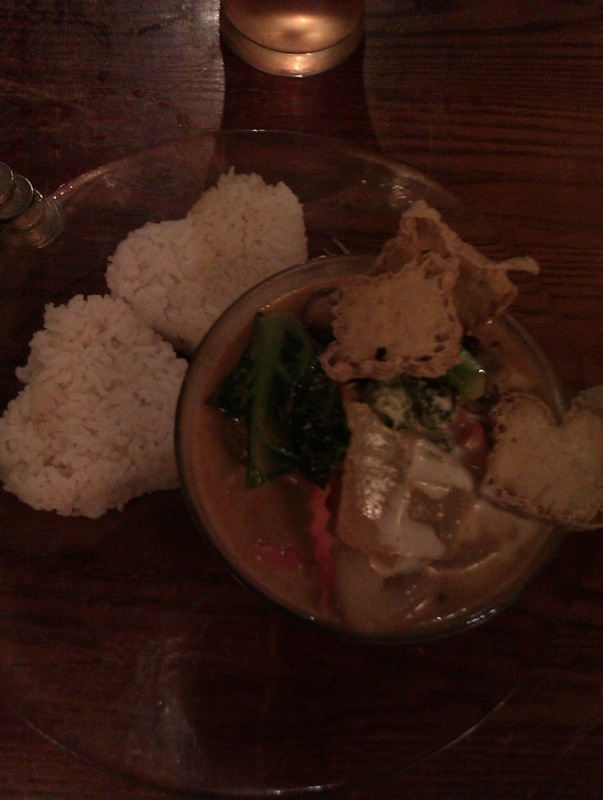 She even recreated the heart rice from last week, mega cute! 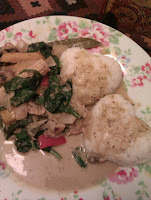 Thai curry a la Hetti - Pretty perfect! Everything's a teeny bit rushed today sorry! Starting my new job tomorrow!